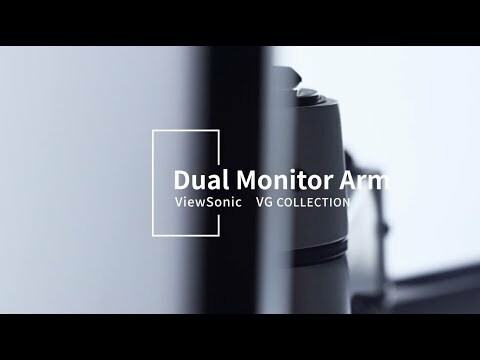 ViewSonic LCD-DMA-002 is a full-motion desk mount, where nothing is compromised so you and your monitor work in unison. With a complete range of height adjustment, swivel, and tilt, the mount is made for healthy ergonomics and breeds inspirations and work efficiency. Accompanying the mount is a multi-purpose desk clamp and a grommet mount for flexible integration into any desk type, while tool-free setup and a quick release design offer you quick and easy installation right out of the box. Enjoy quality workplace collaborations and discussions with high accessibility of the monitors; whether you’re standing up, sitting down, looking left, or looking right, you’re always in the zone to take on any tasks. Reliability is not a concern with arms rated at over 10,000 cycles per arm; additionally, say goodbye to cable cluttered desktops with cable management for the mount. Of course, all packaging is recyclable and environmentally friendly for a smaller carbon footprint. 2 in 1 desk mount with clamp and grommet option that supports up to 27” monitors. The dual monitor arm can adapt to almost all types of office desks with 75 x 75mm or 100 x 100mm monitor mount that is VESA compatible, aimed to increase workspace efficiency. The ergonomically friendly wire spring hovering system easily adjusts monitor height with lift distance from 0 to 148mm. Both arms can amazingly swivel and pivot 360 degrees for landscape, portrait, or hybrid setup to support an ergonomically correct workstation. Enjoy quality workplace collaborations and discussions where monitors are easily accessible for all parties; whether you’re standing up, sitting down, looking left, or looking right, you’ll always be in the zone to take on any tasks. What’s more? A -15 ~ 90 degrees tilt with an adjustable angle setup (up to 100 degrees) makes this a perfect workplace companion, anywhere from your desk. Easy assembly with no tools needed while use the clamp function, the arm comes with quick release design. Set up in minutes. The packaging used for LCD-DMA-002 is recyclable and uses paper-based packaging instead of hazardous PES (Polystyrene). The exterior of the packaging uses mono-colour printing to keep the environment in mind.